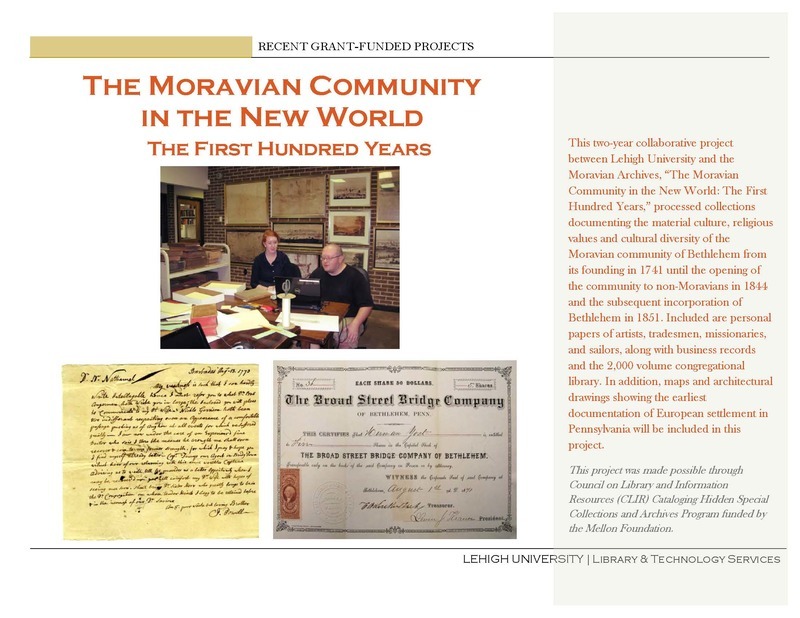 This two-year collaborative project between Lehigh University and the Moravian Archives, “The Moravian Community in the New World: The First Hundred Years,” processed collections documenting the material culture, religious values and cultural diversity of the Moravian community of Bethlehem from its founding in 1741 until the opening of the community to non-Moravians in 1844 and the subsequent incorporation of Bethlehem in 1851. Included are personal papers of artists, tradesmen, missionaries, and sailors, along with business records and the 2,000 volume congregational library. In addition, maps and architectural drawings showing the earliest documentation of European settlement in Pennsylvania will be included in this project.